One evening the hubs and I worked some crazy kitchen magic and created this most amazing hybrid. 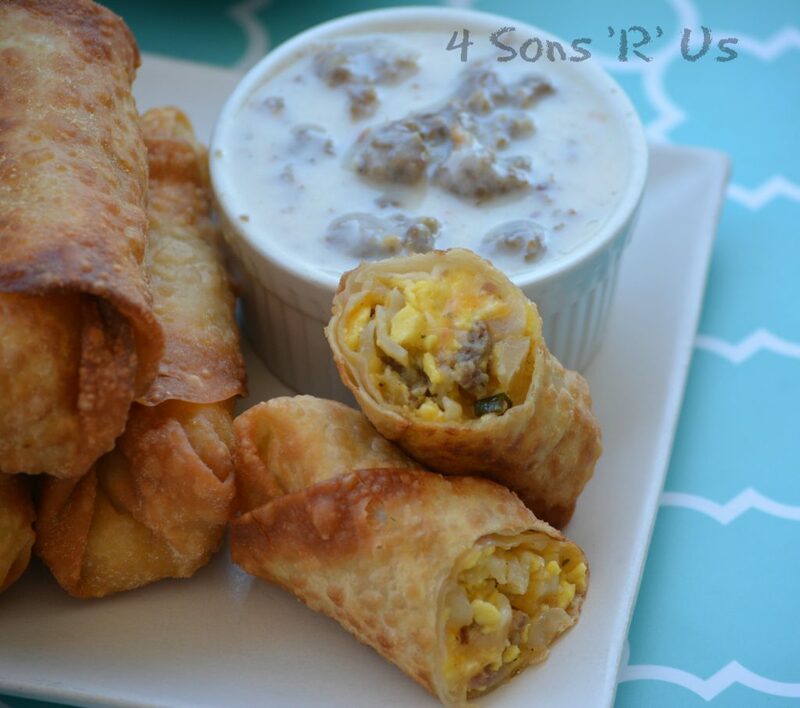 Breakfast eggrolls, with creamy sausage gravy for dipping. It had to have had some divine inspiration behind it. But, like always with eggrolls and sons … well, there was one small problem. One of my favorite parenting, true story, first world problem quotes ever. We’ve all been there. And sometimes we have the fore-thought not to go there again. Other times, well hind-sight is 20/20. But fried things taste so good, despite the weather forecast of caloric hurricanes and grease storms. 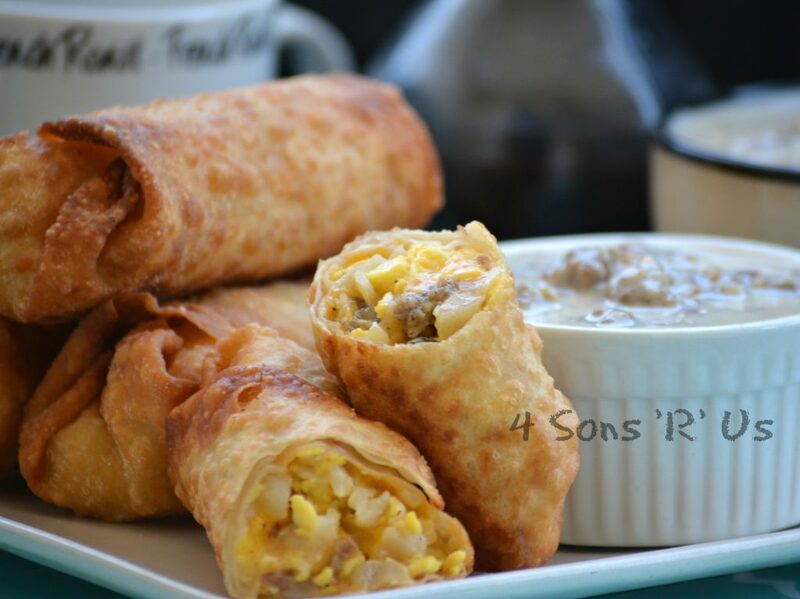 Luckily, I figured out a way to get that same delicious, delicate crisp on our homemade eggrolls AND manage to avoid any messy aftermath: Breakfast Eggrolls with Sausage Gravy. 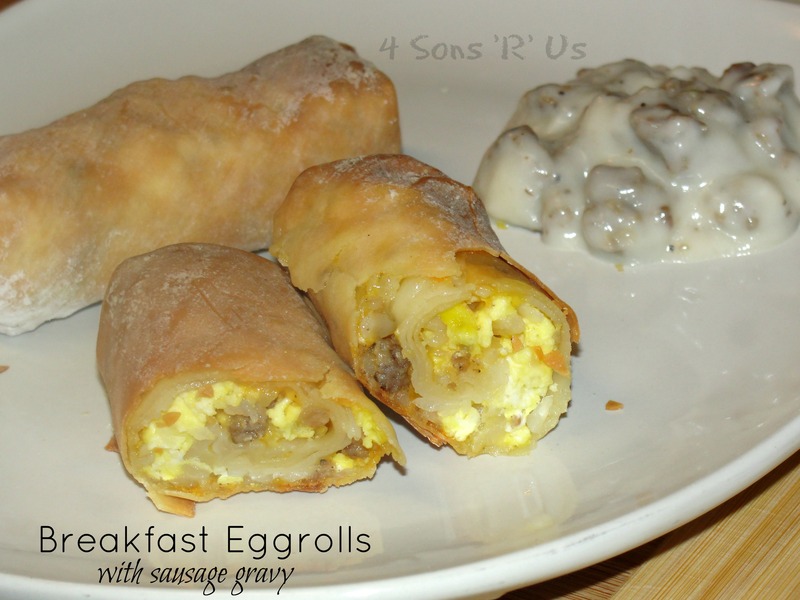 These AM eggrolls have three staple breakfast favorites (sausage, hashbrowns, scrambled eggs) all rolled up in one convenient crunchy package with sausage gravy on the side for dipping. In a large skillet, brown sausage. Drain the cooked sausage. Remove a 1/2 cup of the cooked sausage to a mixing bowl. Add flour to the skillet and brown a little in the sausage fat. Slowly add in the milk, stirring continuously, while it thickens. Salt and pepper the gravy, to taste. Keep on low heat so that it stays warm while making the egg rolls. Mix the eggs and water and then scramble the eggs in a small skillet until just set. Don't worry, they will finish cooking when baked. Add the scrambled eggs to the reserved sausage. Add the potatoes and cheese to bowl with the cooked sausage and eggs. Stir in a 1/2 cup of the reserved sausage gravy. Season with salt and pepper and stir well one last time to blend everything together. To make the egg rolls, take an egg roll wrapper and put about 1/3 cup of the potato sausage mixture just below the center. Fold over one half to make a triangle. You should have about a 1/2 inch of the bottom part of the wrapper still exposed. With you finger brush a little water along that edge to help seal the egg rolls. Then fold in 2 sides forming the egg roll shape. Then roll up the rest of the way into a sealed egg roll. If you're having trouble, use the package pictorial as a guide. Spray the outside of the egg rolls with cooking spray, or lightly brush them with canola oil. Bake at 425 degrees for 12-15 minutes, or until golden brown and crispy on the outside. These can also be cooked by frying them in canola oil. Isn’t it just so accurate?! Adding herbs like oregano, thyme, etc. would pop up the recipe! Great suggestion, Ema! I’m definitely going to see how I can ‘spice’ it up the next time it pops up on the recipe rotation. 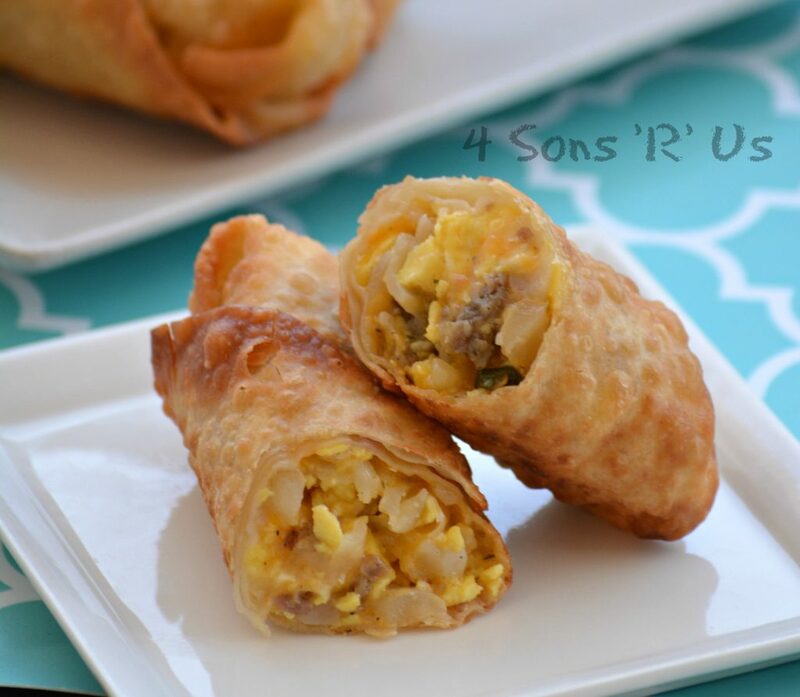 I’ve made many with tortillas but never with egg roll wrappers. Great idea! Might be nice to do mini ones and freeze for when my grandkids visit! Even the sausage gravy could be frozen in small tubs. Hm. Must try! Ohhh! I love how you think, Audrey. This would freeze great, and it will be a great grab and go option in the mornings for the sons. I haven’t used tortillas to make egg roll type things before, but love love love using them to make taquitos of any kind, even breakfast-y fiesta ones. I’m so glad you enjoyed it. You’ll have to let us know what you think! I l love it when I can make some of our tried and trues just a little bit different and ‘new’. Sausage gravy always intrigues me! I really must try it! Yes you do, Fitz! You’ve got no idea what you’re missing. Oh man cheese, sausage, fried. This had to be the bomb! Exactly, but here, it’s without the calories and the grease of fried but with all that same flavor and crunch. These look amazing. We do not get egg roll wrappers in rural France so I might need to roll in a thin crepe. Rolled in crepes? That sounds amazing. Let me know if you give it a go! I love that you posted your before and after pictures! I loved them before, and I’m loving them still! The recipe is so solid it was time I did them justice by updating the pics. These sound incredibly good! I agree with frying these, but baking is better. 🙂 Happy FF. Same here, Jhuls. Frying almost always tastes better, but baking is better for you. Omg, these sound awesome. And sausage gravy dip? Perfect. Pinning for next time we have company, otherwise I could eat them all myself! These are a perfect breakfast for sharing and one that is sure to impress your guests. These looks fabulous! I’m a sucker for anything in an eggroll or tortilla wrapper so I’m all over these!! Yum! How many does this make? Making them tomorrow for a brunch. Jessica, I would say 8-12 depending on how liberally you fill them. Love them as brunch food too. Do you cook the hash browns prior to baking? Nope, just throw them into the bowl as the recipe instructs. Could these be made, say the night before and then baked/fried in the morning? Or would the wrapper possibly get soggy or too soft? We host a Family Breakfast on the first Sunday of the month and these would appeal to all ages. Thanks! I would think so, and wouldn’t risk it without giving it at test run ahead of time. Otherwise, I’d make all of the ingredients the night before, including the gravy and then reheat and wrap them right before ready to roll and fry/bake. The gravy can easily be reheated right before the meal. I always find them in the refrigerated part of my grocery store’s produce section. If you don’t see them, just ask- they’ll know where to tell you to find them. Crochet how many eggrolls does this make? When making your sausage gravy start with a 1\4 lb of bacon cut in 1\4 inch peices in a black iron skillet than fry the sausage in the same skillet, the bacon ad’s tons of flavor…This idea is from an old Pennsylvania farmer.